Just before finishing our restaurant planning for the latest Barcelona trip we heard great fuss about the newly opened Disfrutar restaurant. The new restaurant from Oriol Castro, Eduard Xatruch and Mateu Casanas, is set to become Barcelona’s new culinary sensation. Oriol Castro, Eduard Xatruch and Mateu Casanas were, for years, head chefs of the famous elBulli, the restaurant from which Ferran Adria and his team branded a culinary revolution all over the world, until it closed as a restaurant on in 2011. In May 2012, these three chefs debuted as entrepreneurs with restaurant Compartir, in Cadaqués near Girona. 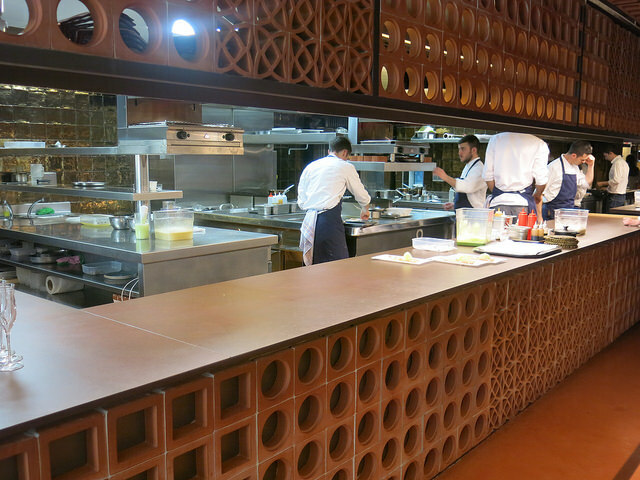 With their second opening in Barcelona they are setting a new level of molecular fun cuisine. 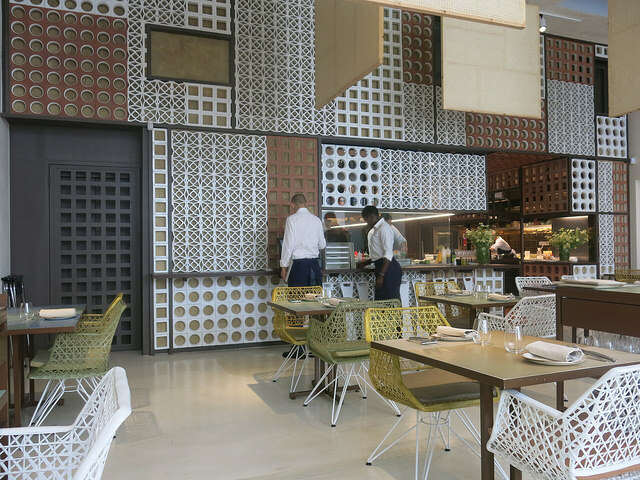 The interior design of Disfrutar carries the signature of El Equipo Creativo. The architects Oliver Franz Schmidt and Natali Canas del Pozo head this architecture and interior design studio. 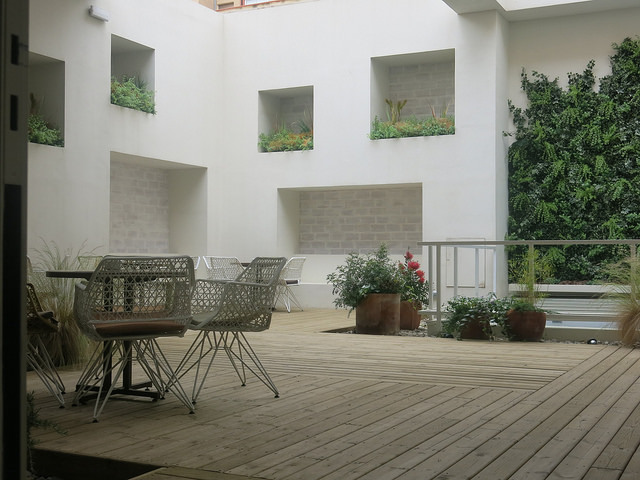 They have crafted a space with three distinct parts that lead a patron through a day in the life. Busy and metropolitan inspired design at first, leading to a Mediterranean-inspired oasis at the end. 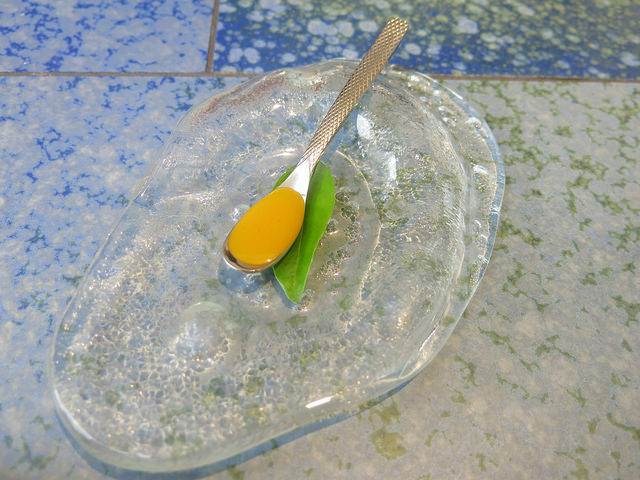 The main design line is based on ceramics, in various forms, colors, and shapes. In the foyer and gastro bar, a modern, urban- inspired design reflects the busyness of the metropolitan area of Barcelona. The corridor between this area and the dining area in the rear of the building is the heart of the operation with an open kitchen. 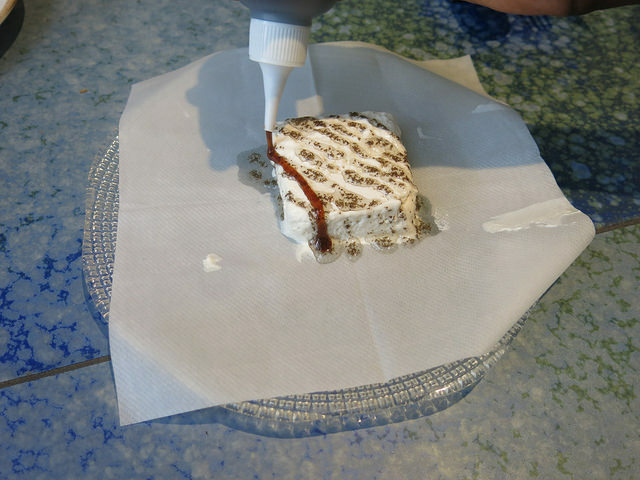 An open design invites you to view the artists crafting their food. Here, the ceramic motif is used as baked brick pieces. Dominated by colorful old tiles and metal, the area is designed to be a mirror; the metal features a reference to the “antique Ninot food market across the street”, and the tiles construction is designed to be a “deconstructed mural by Miró”, the well-known Catalan, Surrealist artist. 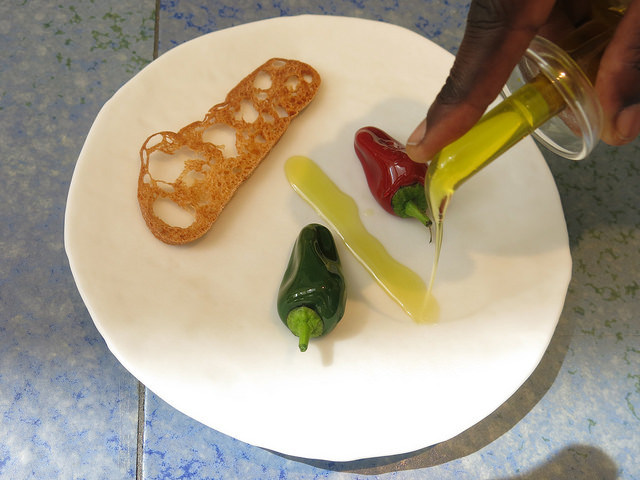 There are two tasting menus offered at Disfrutar: the 19-course menu Disfrutar (68€) and the Festival Menu being a 25-course tasting menu (98€). 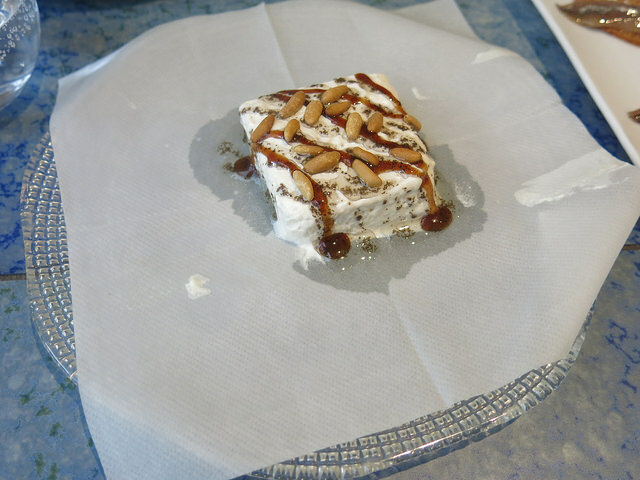 A gastronomic experience is expressed through the use of current techniques and modern presentations. There is a philosophy of shared dishes at the center of the table. 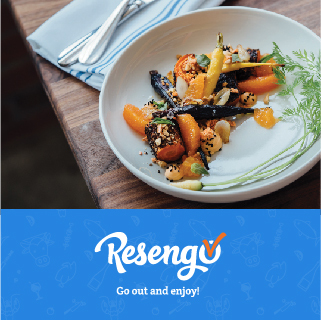 Within this extensive menu you can find the soul of having guests to try to taste as many different things as possible. The festival must go on, ‘disfrutar’ means enjoy! To describe and detail every course would take a very long time, so we have only added it on several highlights. One advice generally stays. 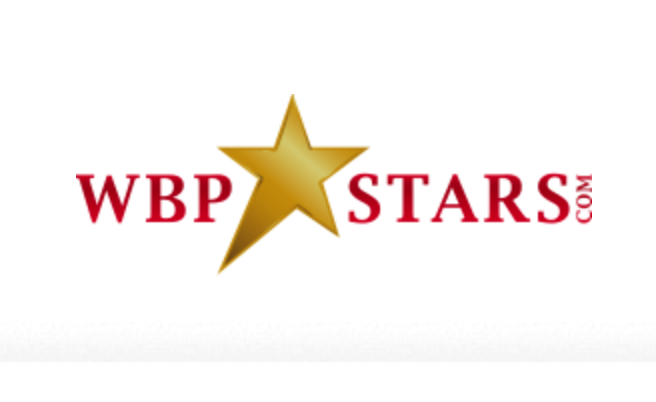 Simply Book Disfrutar at your next visit to Barcelona. After having ordered a bottle cava Recaredo, a biodynamical brut nature Gran Reserva 2008 (33€), we received a cocktail amuse Caipirinha style. 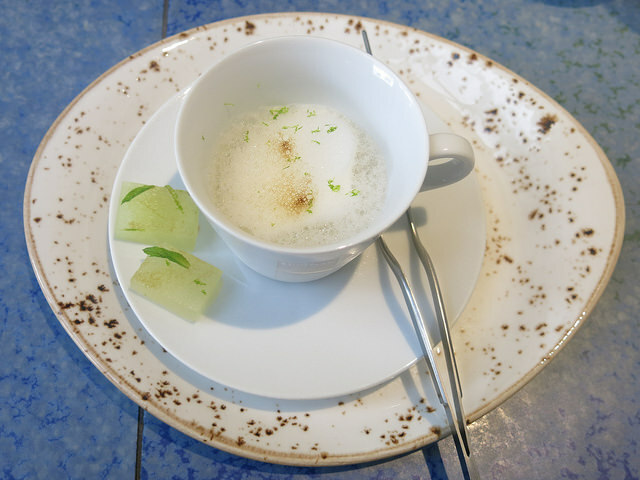 Melon Caipirinha in a cup and prepared at the table. On the saucer an intense flavored cube of fresh melon, covered in mint, lime and salt. The beet that goes out of land! 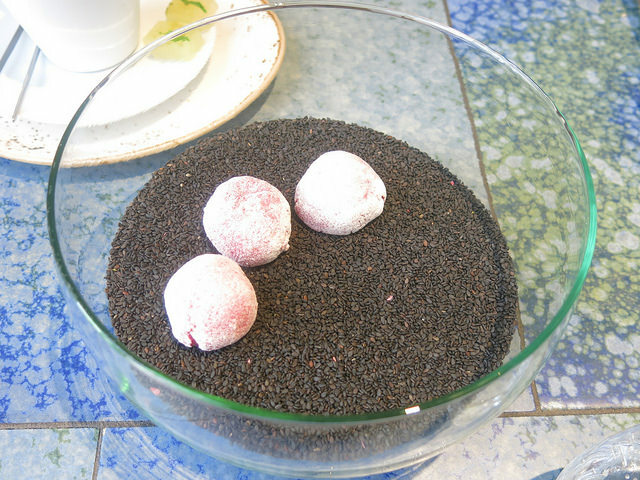 In a ball of black dried rice they served hidden pink balls made from a beetroot merengue. The light and crispy balls appear after shaking the bowl. 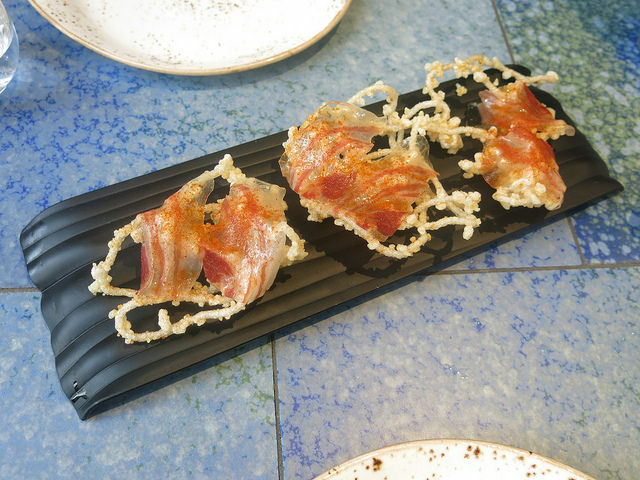 Crispy bow with cured Iberian bacon. 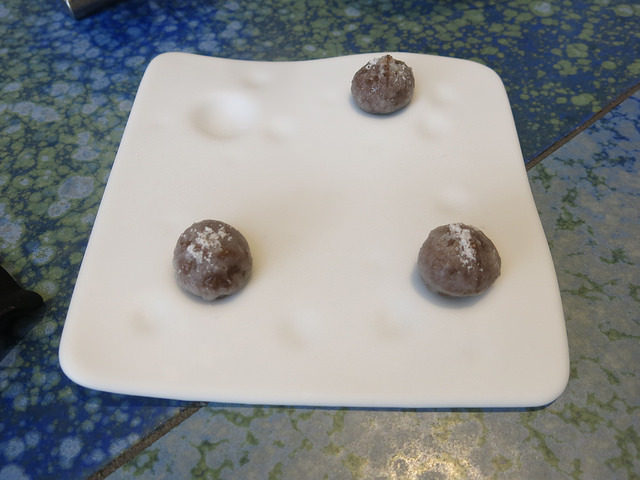 Caramel coated hazelnuts with elderberry. Tomato “polvoron”. 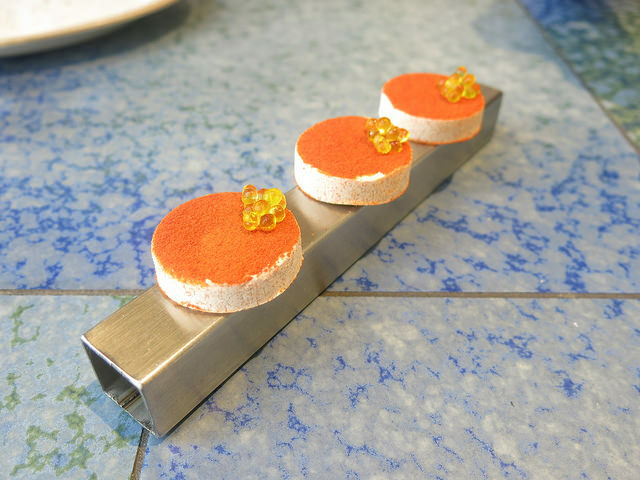 Inspired by a candy from the area and reconstructed with tomato and Arbequina Caviaroli, Caviar made of olive oil. Transparant pesto ravioli. Ravioli bag made with all ingredients of pesto. In the dip and it the mouth you experience a full pesto flavour. 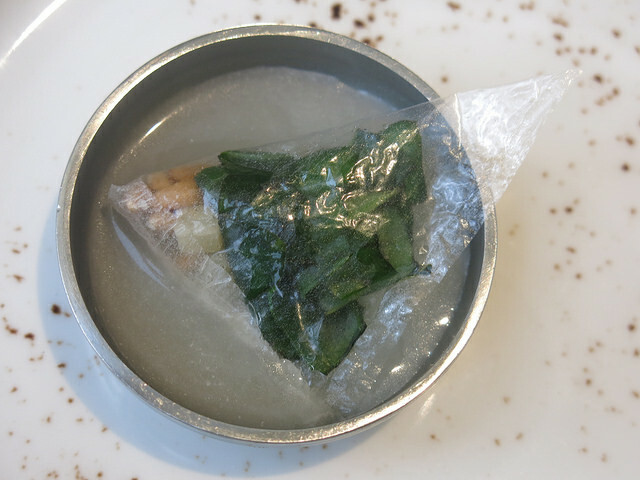 The triangle edible bag contained pine nuts, Parmesan and basil leaves. Than you dip in the Parmesan dipping sauce and you get a mouthful pesto taste. 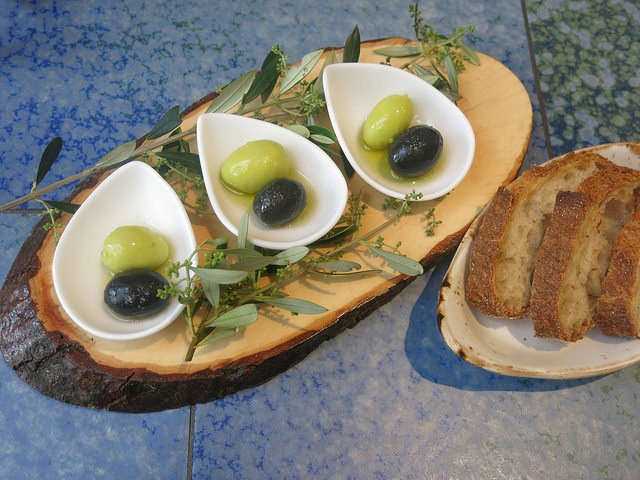 Disfruta de la aceituna, two olive structures with fluid inside and bread to dip the olive oil. The spherification olives have a cocoa butter peal, nice texture around it. 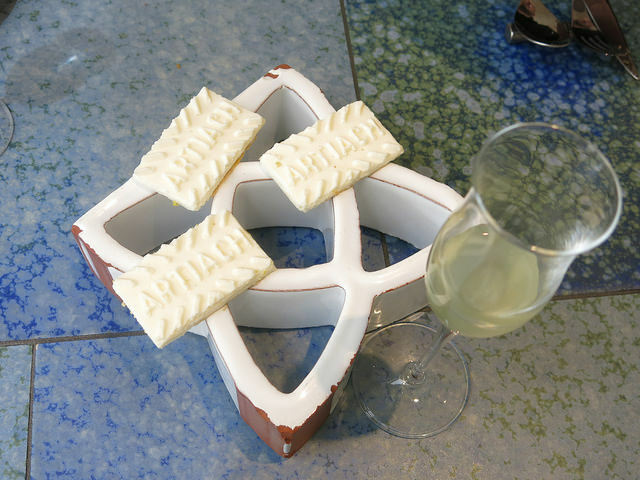 Cracker made of Parmiggiani, smoked and frozen Idiazabal cheese biscuit with apple & celery juice. 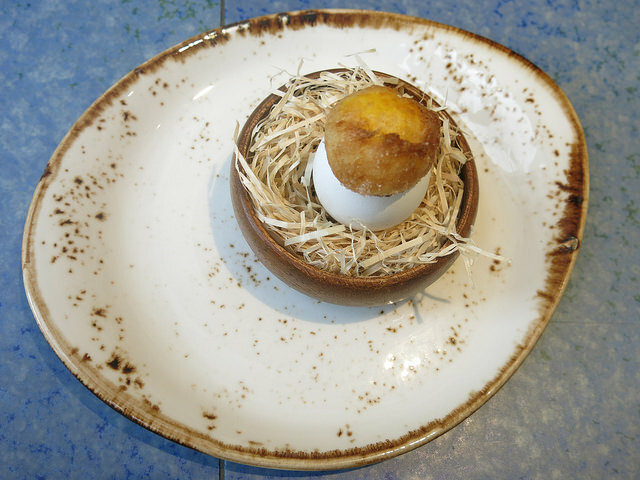 Crispy egg yolk with mushroom gelatine inside. The egg yolk in tempura was perfectly prepared and nicely salted while the mushroom cream inside gave perfect synergies in the mouth. 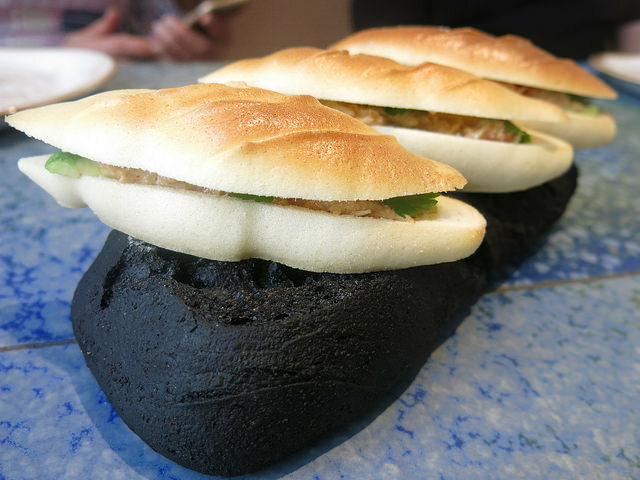 A sandwich made from apple merengue was amazingly soft and served with seafood and avocado salad inside. 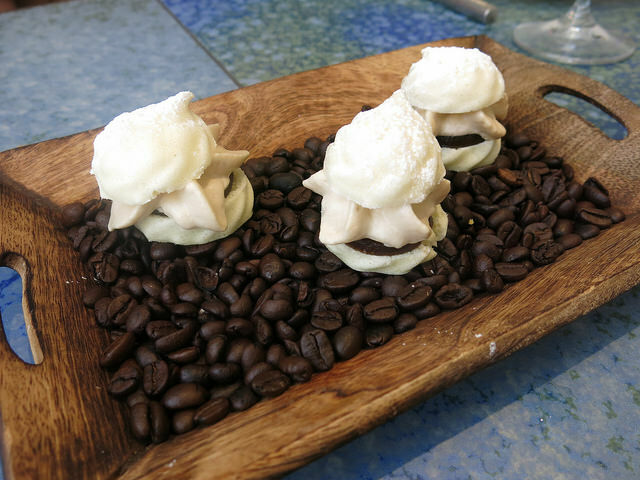 The merengue looks like a mini-sandwich. 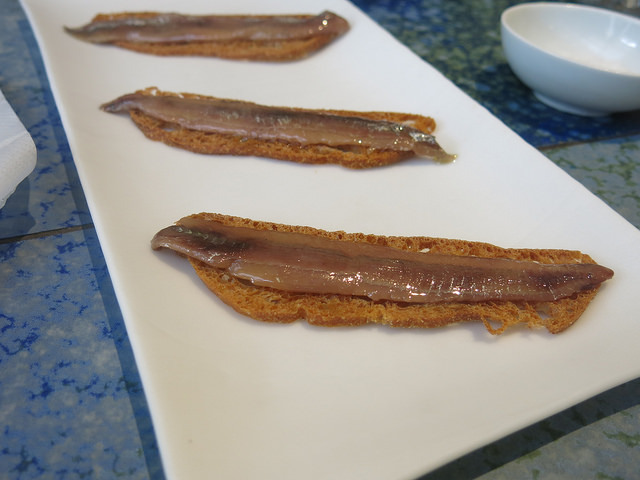 Anchovies and almond “mato” with truffle, fir tree honey and pine nuts. 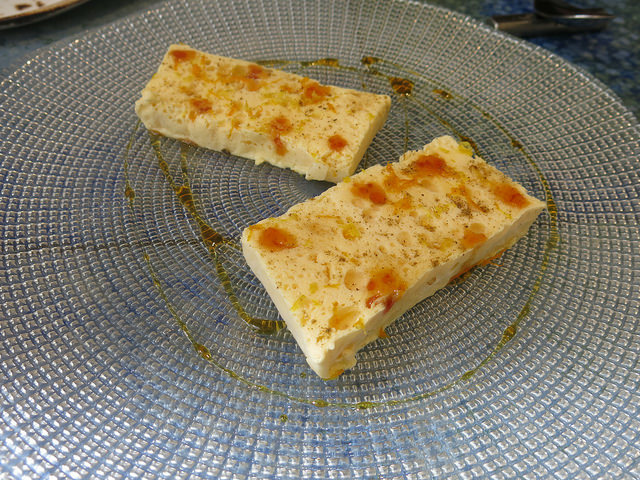 Mató is a fresh Catalan cheese and often served as a dessert with honey in Catalonia. Today, they put their own spin on the Catalan classic. 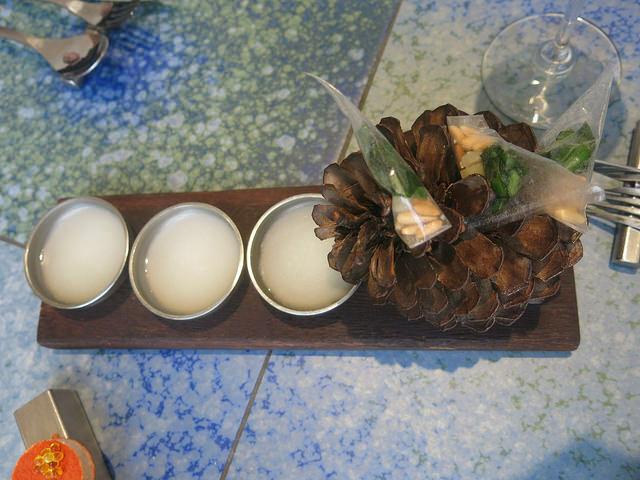 They made this mató lookalike with almond milk and serve it with syrup of black truffles, pine honey and pine nuts. 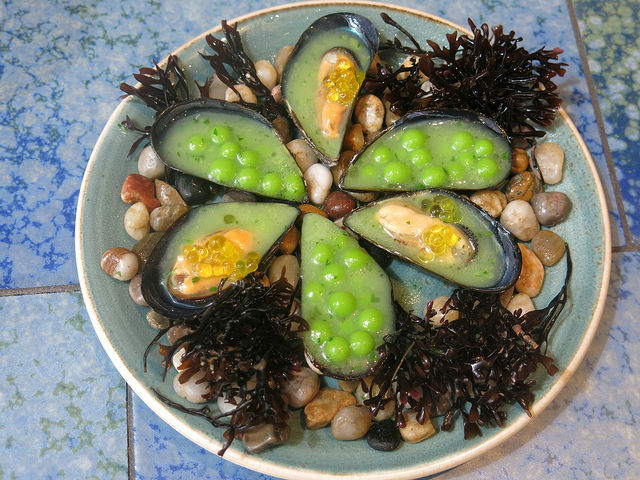 This to combine with the tasteful salted anchovies. 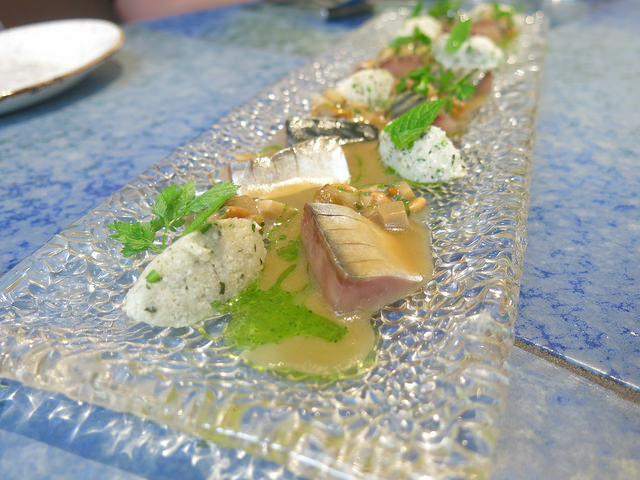 Marinated oily fish (mackerel) with cauliflower taboulé and mushrooms. 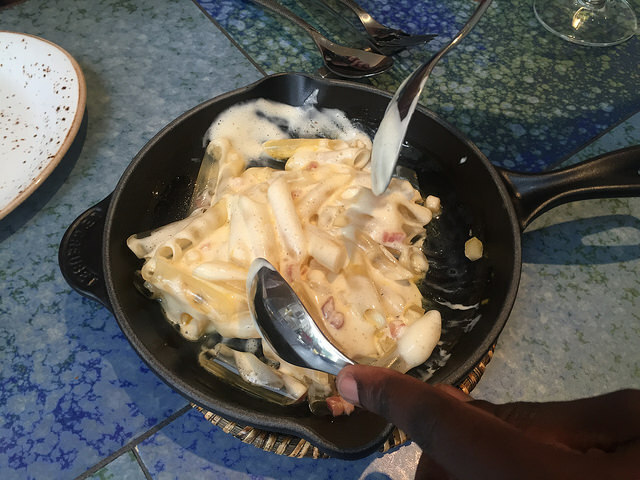 The sferifaction version of Macaroni Carbonara, which is a penne, made of gelatine and served with little cubes of bacon. 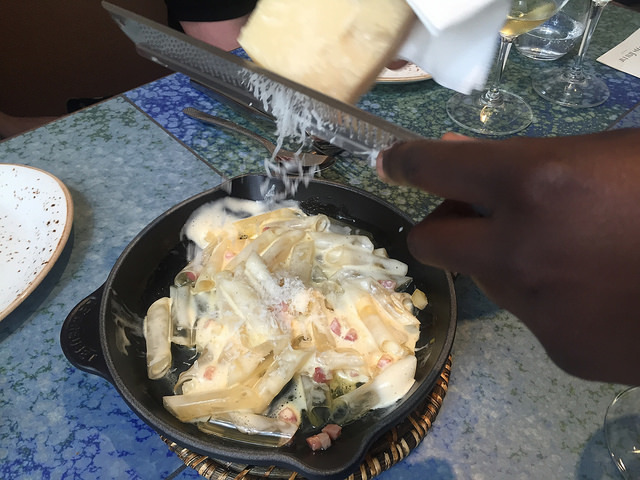 This was topped with Carbonara foam and shaved Parmesan cheese and mixed at the table. 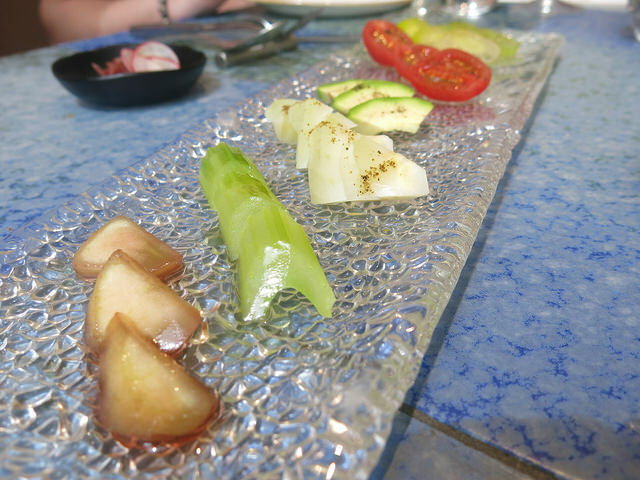 Vegetable sashimi: a sashimi interpretation with for example celery with eucalyptus, avocado, tomato, fennel, cucumber, endive and apple. 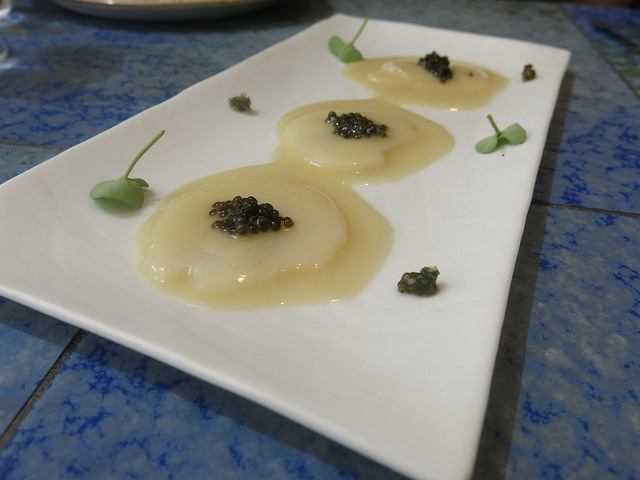 Scallop “Marrow” with Ossetra caviar, creamy sauce and mint & onion pickles a side. 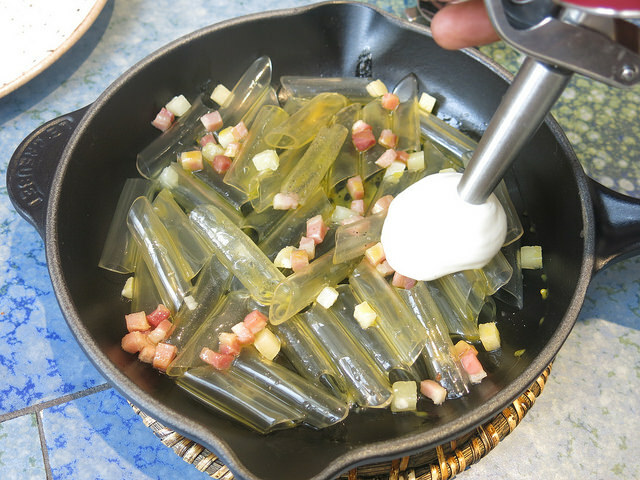 It was great when combining with the mint pickles on the side as it freshened up the dish. 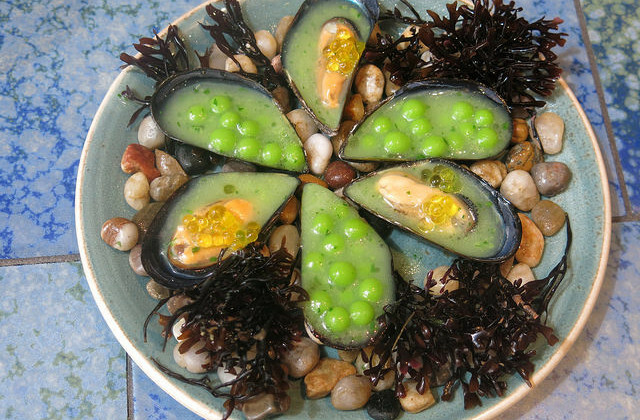 Mussels in salsa verde and peas resembled by molecular cooking. 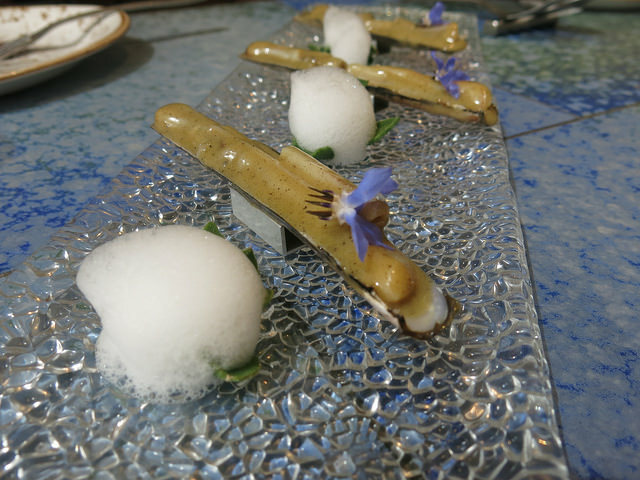 Razor clams with a foie and truffle cream. 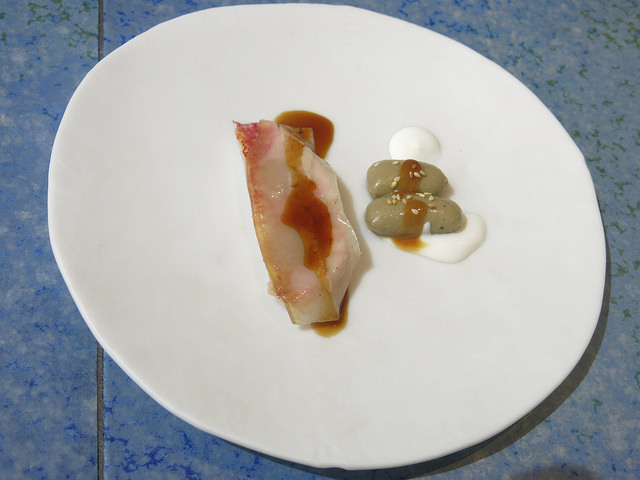 Red mullet with pork jowls and soya sauce was served with eggplant gnocchi with yoghurt. The fish and lardo were very good, the gnocchi a bit boring and we did not find the match between both sides. 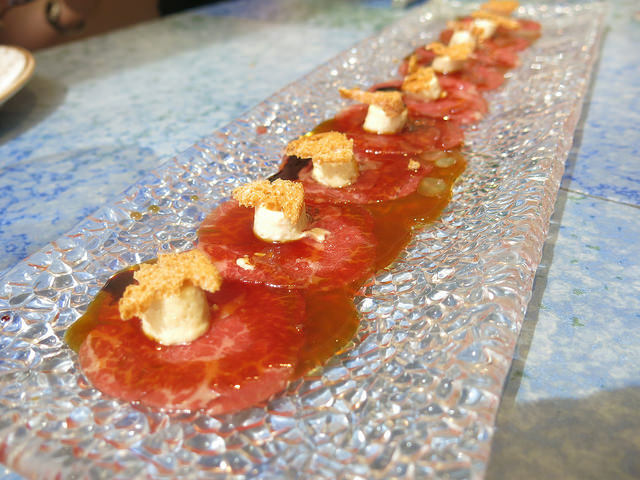 Beef carpaccio ‘Périgueux’ to eat as a cannelloni, filled with foie gras. 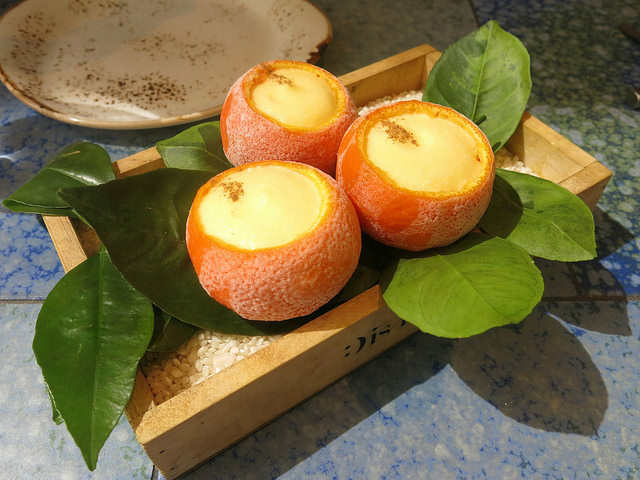 The Tangerine: a fresh tangerine was served filled with granité, rose gelatine, cream from mandarin and Cointreau and a parfait. 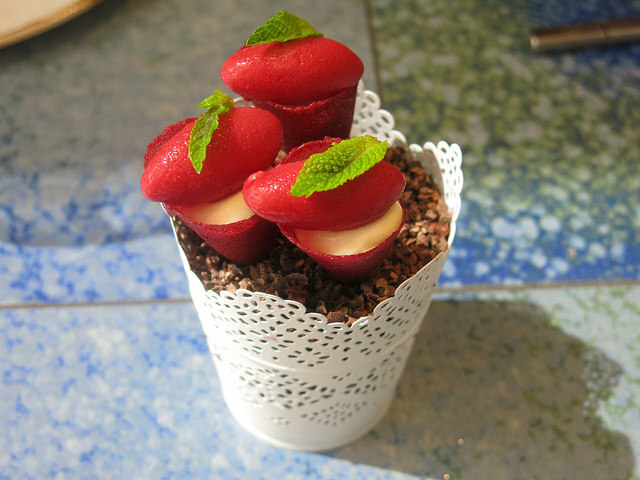 Cheesecake cornet: A cone made of raspberry filled with cheese cake and on top a raspberry sorbet. A Catalan frozen cream bread with blood orange couscous. 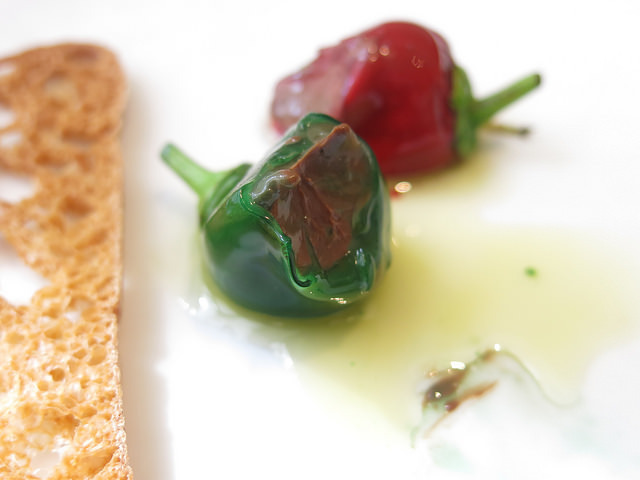 Chocolate peppers on toast with oil and salt: the inside under the jelly skin had a rich chocolate ganache which was flavoured differently to give two different tastes. The red one had off course a spicy touch. We also tasted a delicious white Rioja: the 2005 Vina Gravonia Crianza Blanco from Bodegas R. López de Heredia. This wine had an excellent palate of aromas with Ripe white fruit, nuts and almonds. 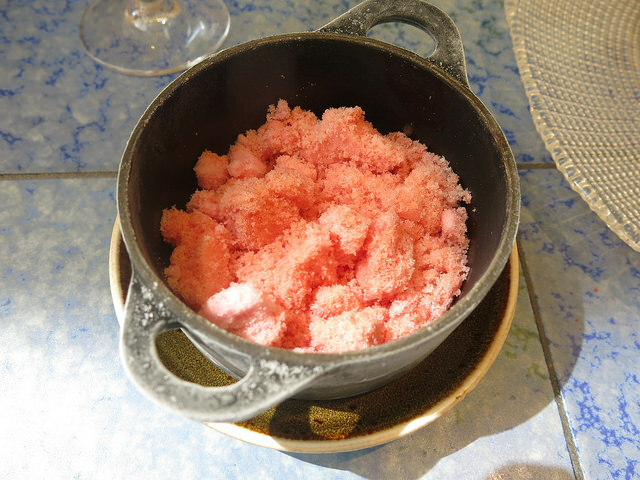 Disfrutar was one of the best gastronomical experience with also fun aspects this year. Light dishes were served in tapas style and given a perfect touch with adding seasoning and playing with different textures. 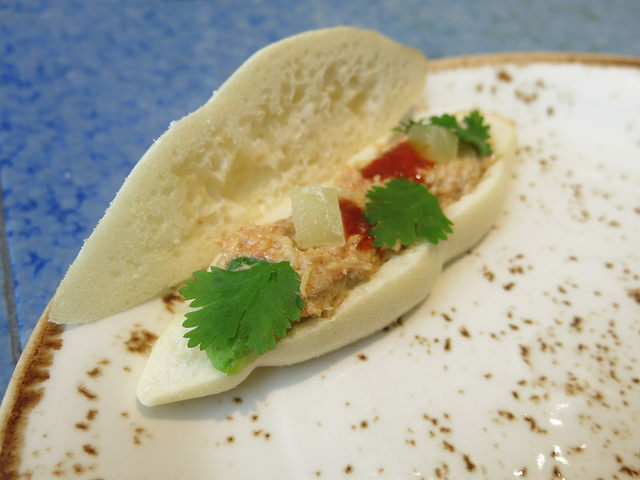 Disfrutar serves a modern but honest kitchen based on quality ingredients and special techniques. With a perfect value for money experience we strongly recommend a visit during your next stay in Barcelona. If you have missed ElBulli don’t hesitate now. Disfrutar! Last updated by begusto at 08/07/2015 .